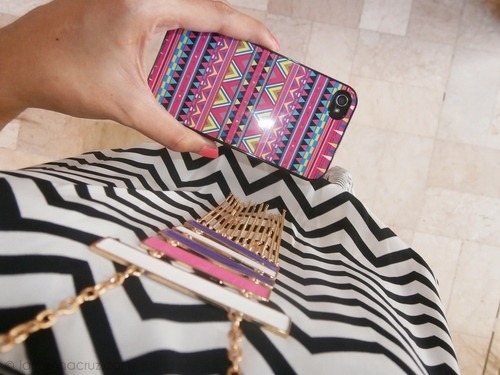 I have a huge interest about aztec patterns nowadays because they are so refreshing for me, colorful aztecs beams positive vibes over me just like my iPhone Pink Aztec Pattern case from ANOTHER CASE, I'll be making a separate review post for those lovely cases I got from their shop. I'm wearing my Black/White Chevron Caged Back Romper from WILDDOLL. This romper is very light and easy, featuring a caged back and side pockets for added detail and comfort. I admire its simplicity which gives me a chance to style it up with colorful accessories. And I have good news about this romper, lovelies! It's actually on SALE right now from $24.97, its price now is $14.97! $10 deducted, ain't that awesome? Lovely romper on a not so expensive price. :) Go visit their shop HERE. 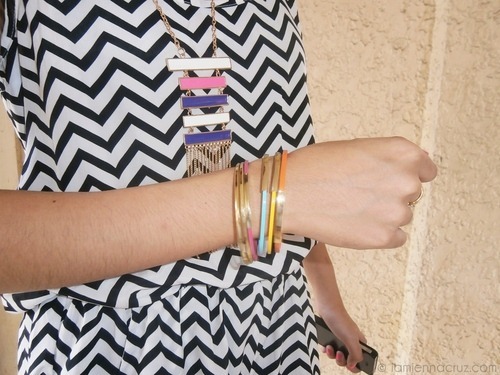 My lovely necklace and bracelets are both from KIKAY KAYE SHOP which I already mentioned on my previous outfit post. And don't forget to join the ongoing giveaway HERE. The back details of the romper. That's all for now, mi lovelies! Hope you liked them ;) Buon Giorno! I want everything esp the shoes omg! Thanks so much mee!! How about the makeup? Lol! haha! amazing prints, sis! :) love the back detail of that romper! Fashion Gallery's Big Blog Giveaway! ROMWE's Best-Sellers are on SALE! What's NEW at Wild doll?